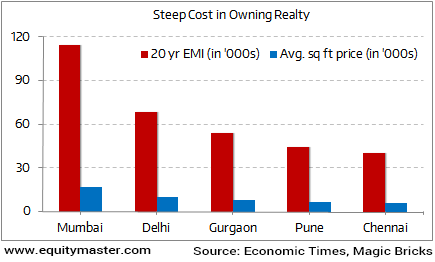 Home > Special Articles > India: High Cost of Property Ownership keeping Buyers Away..! India: High Cost of Property Ownership keeping Buyers Away..! High Cost of Property Ownership keeping Buyers Away..! The latest data coming from the Indian real estate sector is clearly not encouraging. People made huge gains in realty between 2002 and 2013. Realty prices multiplied many times over. However, as per an article in the Economic Times, the good times in real estate are over. The reason is simple. There are no buyers anymore. Today's chart highlights the cost of owning real estate. It is indeed very steep. It should come as no surprise that Mumbai comes right on top. This merely confirms what Mr. Vivek Kaul had been alluding in his posts regarding the unaffordability of Indian real estate. What this number tells us is that most salaried class in 2011-2012, were not in a position to buy a home to live in, across large parts of India. There is no reason to believe that things would have changed since then. The point is that the demand for real estate is in the below Rs. 20 lakh market price segment. But what is being built across large parts of the country is clearly above that price. As RBI governor Mr. Raghuram Rajan said in a recent speech: "I am also hopeful that property prices adjust in a way that encourage people to buy."